Welcome back to the second installment of Demystifying our Digital Scholarship Center and of our conversation with Jennifer and Alex, CLIR fellows at the Temple University Libraries. If you’re just joining us, you can link to the first part of our interview where we speak about their background in digital scholarship and tackle a few key terms. Below, we will focus on the fellows’ research and the idea of digital scholarship within the library ecosystem. Next in my series “Demystifying our Digital Scholarship Center”, I speak with Matt Shoemaker, librarian and coordinator of the DSC, about gaming and critical making. Can you each talk about your trajectory within the digital humanities. 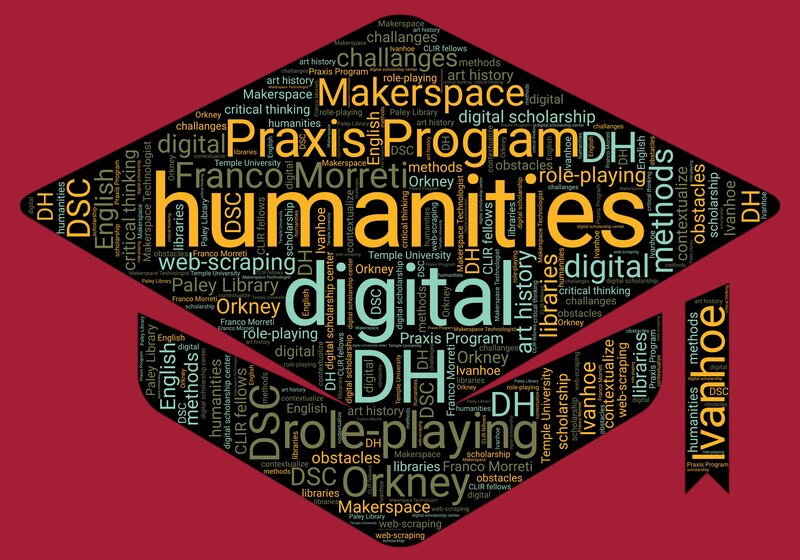 When you embarked on your PhD project, did you already have some sense of how your research fit within the boundaries of the digital humanities? If not, how did you find yourself engaging with its principles over time and developing a project within a digital humanities approach? Jennifer: I attended the University of Virginia for my PhD. In their library they have the Scholars’ Lab, one of the earliest DH centers. I was first a fellow and project manager in the Praxis Program, which introduces students in the humanities to DH through tool building. We learned the basics of coding and continued the development of a role-playing platform called Ivanhoe. I then stayed on in the Scholars’ Lab as a Makerspace Technologist in order to diversify my skill set in anticipation of graduation. Through the process I met people working on very interesting projects and was able to incorporate some of these methods into my dissertation research. Alex: When I started my PhD, in the first semester we read texts by Franco Morreti. I wanted to come up with a project that would intervene in certain debates about world literature articulated by Morreti and his interlocutors. At that point it was difficult to get a sense of the broader DH discourse. I’m still getting a sense of who would be interested in what I’d have to say and to whom it’s relevant. A lot of the project building during my doctoral studies happened like it does for many people in DH, that is, parallel to the dissertation work I was doing in my discipline. It became clear that while my DH project was borne out of my dissertation, it was enough for a separate book project. Can you both talk about your own research and projects in the DSC. Specifically, how have the tools and techniques of digital humanities added value to your own research interests? Jennifer: I use digital methods to add data or information to my existing research. My dissertation looked at medieval architecture and its cultural context through literary descriptions and landscape studies. GIS viewshed analysis allowed me to reconstruct and hypothesize what would have been visible and intervisable from the cathedral I studied. That capability has produced more critical questions. At this time, I’m in the process of adding new sites and structures to my analysis to better understand the entire landscape and seascape of medieval Orkney. Alex: Digital tools have helped me contextualize my reading of a wide variety of texts. My current project involves born-digital material so I use tools and techniques like web-scraping to access that information. Many people find themselves doing “DH” research because their world is increasingly mediated by digital technology, necessitating critical perspectives developed in fields like media studies. The question isn’t so much how I will use DH tools and techniques moving forward, but if it’s possible to take a break from them. Some of my literary criticism could have been done without the tools and techniques of DH. However, I wouldn’t have had the same perspective. For work involving new media– new forms of digital communication– it would be impossible not to use digital humanities tools and techniques. Is there a scholar or digital humanities scholarship that you’re particularly excited about, here at Temple or elsewhere? Jennifer: Sometimes I feel like I’m split between two fields because there are DH conversations about new methods, tools and projects that may or may not be useful to art history, and then academic publications that I have to keep up with. Sometimes it’s hard to keep up with both, but I try to balance both discussions and bridge the two. Two digital scholarship conversations I’m interested in now include sustainability / preservation of digital projects and the increased focus on public engagement / accessibility. Alex: It’s overwhelming how much important work is being done. I could name drop a bunch of people from, for instance, English, but there are also people in computational linguists, who, if not for their work, literary scholars would hardly be able to get off the ground. There is a difference between publishing really compelling scholarship and making useful tools, models, and datasets. More generally, I hope that “DH” will change, no longer burdened with being a placeholder for interdisciplinary work, instead becoming so normalized as a set of approaches for teachers, scholars, librarians, and students, that it will dissolve as the definitive term. A lot of the best projects within the field don’t stick out like a sore thumb as DH, but are just really important scholarship in their disciplinary field that also involve and benefit from digital methods. I’ve noticed at many other institutions, digital scholarship centers are known by some other name. Why, at Paley, did we with go with “Digital Scholarship Center”? Jennifer: By focusing on digital scholarship rather than DH specifically, perhaps the name was intended to be inclusive to as many disciplines as possible. In the new library, most likely, it will have a new name. I’ve also noticed that some centers aren’t directly part of the academic library. Is there a particular strength to housing the DSC within the library? Jennifer: There are a few reasons that libraries are cited as ideal locations for digital initiatives. Libraries are generally considered neutral spaces on campus, which means they are accessible to all disciplines and well poised to foster interdisciplinary collaboration. A lot of the questions that digital scholars grapple with, such as data creation and curation, overlap with libraries’ emerging role in the 21st century. Also, libraries often have a stream of funding that could support these initiatives. Alex: For me, an ideal vision of the library is as a hub, where all disciplines can meet. It makes sense to position the library at the forefront of fostering such interdisciplinary work with both digital methods/tools and information science. What is the biggest challenge faced by the DSC at Temple? Jennifer: Generally, awareness of the DSC is something that we struggle with. We often encounter people who don’t know about the center, our resources, or digital scholarship generally. Alex and I try to do a lot of outreach to get scholars and classes to the center. We also model digital methods in our own research to show how digital tools can be applied to research in sometimes unexpected ways. Another challenge is the lack of a shared vocabulary across all disciplines. For example, when an art student visited our space a few months ago, I let him know we offer fifty grams of free 3D printing materials for research. I was surprised when he asked “It’s an art project, does that count as research?” My response was “Of course!”, but it really helped to underscore the challenges of bridging disciplinary discussions. Alex: The challenge is to get people to work collaboratively and use our resources for their projects while also maintaining a healthy ecosystem. We can’t service thirty thousand students at Temple, but we would like to see a real diversity of staff, faculty, and students benefiting, contributing, and growing the interconnectivity of the campus through the resources available in the DSC. How can people get more information about the DSC? Alex: They can visit our website, sign up for our newsletter, attend our workshops, but the best thing is to visit us on the ground floor of Paley to talk to myself, Jennifer, Jordan, Matt, Peter, and the graduate students. We also intend to increasingly reach out to library departments and academic disciplines to build the subterranean and institutionalized networks necessary to support innovative research and pedagogy. Stay tuned to the “Demystifying our Digital Scholarship Center” series! In our next installment, I’ll speak to Matt Shoemaker, librarian and coordinator of the DSC, about gaming and critical making.